Hey guys Marty here with MartyMusic, hope your week is off to a good start! 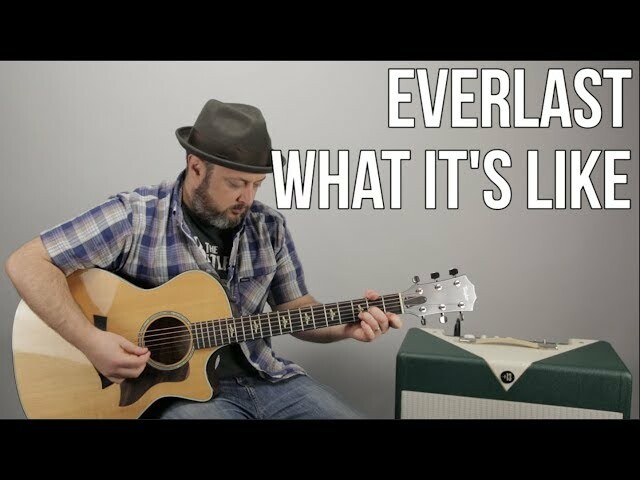 Here’s an easy acoustic lesson to ease you into Monday, it’s “What It’s Like” by Everlast. Thanks and see you again soon! Thanks for supporting me right here at my channel! Free HD courses when you sign my newsletter at http://www.MartyMusic.com ! Could you do a video on Walking back to Georgia by Jim Croce please? Anyone else keep muting the pull off on the bottom string? I think my fingers are too fat. Can you please do “Push” by Matchbox20?! I’ll pay you! Love your videos!! They’re very helpful and easy to follow along with!! Any chance of doing one on Skynyrd’s “Mr. Banker”?? Hey Marty just wondering. Are you muting the low E with ur thumb? Hey Marty! Can you do a break down for Staind, It’s been awhile. Really appreciate the chance to learn from a master. For anyone curious.. Down, Down, Down, Down Up, Down, Down, Down, Down Up. Marty, your instruction is amazing. I really appreciate it! Thanks Marty! I was hoping to see some Everlast! I hope my in-person guitar instructor doesn’t see this, because I have to say that Marty is my favorite teacher. Thanks for clear instructions. What is the strum pattern for this song because im really confused on it. Also still tryna get the bridge down. Could someone give me the strum pattern and give me some advice for the bridge? Hey Marty I am 33 years old and have always wanted to learn to play the guitar. Your videos have helped me alot. Thank you for putting something innocent, and pure on YouTube in a world of horrible things. I’m doing alot better. In 2 months I’ve gone from not knowing anything about guitar, to being able to play 8-10 chords, and the song “Wish you were here” including the solo. Thank you again!!! I heard this on the radio the other day. I hadn’t heard it in a long time. I thought to myself “I should see if Marty has a lesson for this?” Now I can play it and it’s easier than it sounds.